The Best Sales Experience. . .I Hope You Never Have. On Monday, August 22, 1994, our dreams were shattered when my wife Laura was diagnosed with cancer. Sensing the gravity of the situation, Dr. George Cierny carefully placed a box of Kleenex on the adjoining table before telling us that a grapefruit-sized tumor had been discovered in Laura’s hip. She had lymphoma, and we were both devastated. In the blink of an eye, life as we knew it had changed. With a bouncing baby girl, two thriving professional careers, and a nice home in the suburbs, we had been living out the American Dream. Now, we were faced with the challenge of chemotherapy, the loss of Laura’s mobility, and a 60/40 chance of survival. Laura’s career was halted and she would probably lose fertility. On top of that, Dr. Cierny, as if he was looking down the barrel of a loaded gun, added, "We probably won’t have to amputate…but we’ll see." Unless you have actually been there, it’s hard to imagine the emotional impact of this news. It was like being hit in the face with a brick. The grief on my wife’s face was daunting. I remember thinking, "This can’t be happening!" Success in my business life suddenly seemed unimportant. The fact that sales were booming was insignificant. Though I had achieved top sales honors for several consecutive years, these accomplishments now paled in comparison to the new challenges that lay ahead. It was a helpless feeling. After all, what difference does success make when everything else is falling apart? After grieving over this news for several days, life found a way to slap us back into reality. The daily routine took over. There were chores to do and mouths to feed, and our two year-old daughter needed our love and attention now more than ever. Self-pity was fruitless. Instead, we dug in-knowing that we were engaged in a battle that would yield only one winner. Laura underwent chemotherapy treatments for six long months. When she wasn’t in the hospital with complications, she was at home-struggling to maintain her strength. I continued to work, but mostly for therapeutic reasons. Selling was a release of sorts, one that helped distance me from the uncertainty of her medical condition. The usual 70-hour work week shrank dramatically, and it was safe to assume that my sales would suffer as a result. Selling was still a passion, but it was no longer a priority. This adversity caused my perspective to change dramatically. With respect to my selling career, it was as if a great burden had been lifted, where all the stress, anxiety, and pressures that usually exist in a competitive business situation were suddenly gone. No more nervous butterflies before key presentations. No more agonizing over things that were out of my control. While I still wanted to do a good job, I didn’t have the time or the emotional energy to worry. As a result, I relaxed and focused on those things that were most important. Ironically, this change in perspective placed me in a unique position of strength. Because I was no longer intimidated by the threat of losing a sale, it was easy to ask the "hard" questions without fearing how customers might respond. It was also easy to differentiate important action items from other things that were unnecessary. Those action items that were beneficial for the customer, my company, and me, got done. Anything that was unreasonable, superfluous, or unnecessary, didn’t. It was that simple. Everyone (including me) expected my sales results to drop off considerably, but that didn’t happen. Devastation gave way to new resolve, and any lingering trepidation regarding a sale was quickly replaced by a new sense of clarity and purpose. In fact, during the six month period that Laura was sick, I worked less and sold more. But not just a little more. I sold twice as much as I ever had. Twice as much! I couldn’t believe it. The significance of this eclipsed anything else that I had ever accomplished. Through a strange twist of fate, Laura’s illness had actually created an opportunity. It had given me a chance to view the sales process from a completely different perspective. When new priorities took over, I no longer had anything to lose, and when the traditional risks of failure disappeared, my effectiveness soared. It was horrifying and enlightening at the same time-which is why I call it, "The best sales experience…I hope you never have." With the efforts, prayers, and support of countless people, Laura’s cancer was reversed into full remission. She had been to the edge and back-and when the battle was over, she emerged the winner. Laura reclaimed her energy, but she never lost her spirit. Several months later, thanks to the miracle of modern medicine, her hip was replaced and her mobility was fully restored. She was back. Almost two years after Laura was diagnosed, tears flowed once again as the city of Atlanta was getting ready to host the 26th Summer Olympic Games. When the organizers for the Olympics heard about Laura’s story, they recognized that she had faced the ultimate personal challenge and had won. Because it was clear that her victory over cancer was as great as anything that would be achieved on the athletic field, she was given the honor of carrying the Olympic Torch. 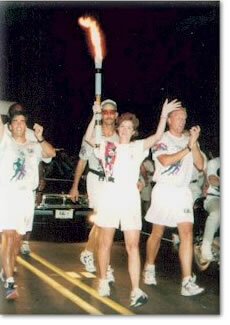 On July 19th, 1996, friends and family joined an enthusiastic crowd of 50,000 people who lined the streets of Atlanta to cheer the Olympic torch relay as it passed by on the way to the opening ceremonies. Whether they knew it or not, they were cheering for Laura too as she hoisted the Olympic Flame-a symbol that reflected her own personal accomplishment. In fact, if you look closely, you can see the gold medal in her eyes. While adversity didn’t actually teach me how to sell, it did inspire me to complete my dream, which you are now holding in your hands. 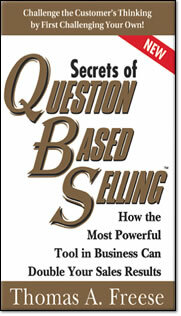 The original Secrets of Question Based Selling and this updated version is the result of many years of extensive research, coupled with some good old-fashioned trial and error. As a sales methodology, QBS has already endured the test of time, and it has also proven itself in many different industries. Nineteen years later, Laura is back to full strength and is very healthy, to the point where you would think she’s never even had a common cold. We were also very fortunate to be in the very small fraction of best-case scenarios where Laura was able to regain her fertility and we were able to have our second daughter (our miracle child) in 1998. Hooray! My sincere hope is that this book will inspire you as much as it has me and the many others whom I have had the opportunity to instruct. Life is short, and success is definitely within reach. May your own experiences in sales, and in life, build on the premise that faith, commitment, and hard work will always persevere. Always!